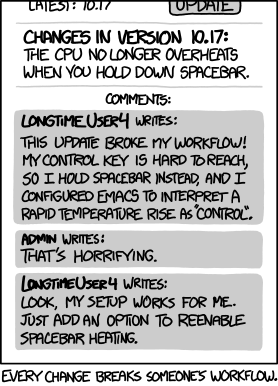 Couldn't resist sharing this xkcd cartoon on Workflow as this issue is faced by both users and the developer in Toodledo. I do not mean to misuse the forum -- posted as a one-time exception. Enjoy! You get to view the mouseover, and there's a more obvious connection with https://xkcd.com. This message was edited Mar 20, 2018.